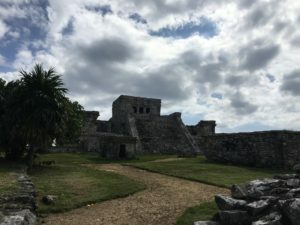 From your hotel you will head to the Tulum Ruins where you will spend 2 hours exploring the Mayan city of Tulum. Your private guide will provide you with amazing information and take you on a journey back in time. You will see the most breathtaking views next to the Caribbean Sea and enjoy a quick dip in the beautiful beaches of the Tulum ruins. Afterwards, we will head to a private cenote, a semi-open cenote and a full cave cenote. These three different types of cenotes are seen throughout the peninsula of Yucatan. 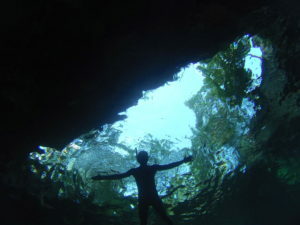 Here your group will experience the underside of the Earth and the serenity of the sacred waters of the cenotes. Your guided tour of the cenote is guaranteed to be an amazing experience! And for a perfect end, we will stop at one of Tulum’s most precious lunch spots for fresh seafood and Mayan traditional plates. You will enjoy this fresh and authentic food close to the shoreline of the beautiful Mexican Caribbean Sea.